I guess I’ve dragged my feet long enough on fall baking. I miss fresh tomatoes, basil, cucumbers & zucchini already. And warmth, I miss warmth. I’ve already seen the first flurries of snow here in MI and I am not impressed. I do love fall squash though. A new phenomenon for me and now that I love it, I love it all the way. I’m mostly an all or nothing sort of girl in the food department. I had a fresh-from-the-field Buttercup hook up this fall and have eaten more than my fair share in the past couple of month. So why not roast & puree some? It’s a perfect substitute for all the pumpkin that gets thrown at us this time of year. 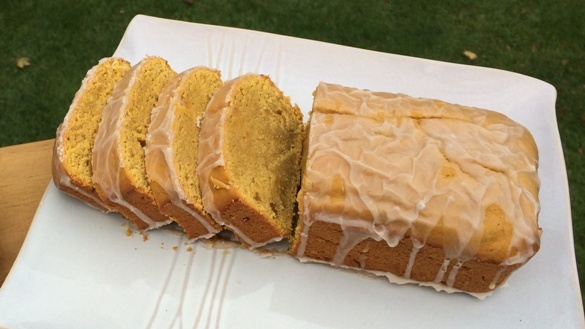 Don’t get me wrong, I like pumpkin in baked goods. In moderation. I am not a pumpkin pie lover or a PSL lover and I am not running out to buy pumpkin spice Oreos or M&Ms. Give me a nice pumpkin bread or muffin. 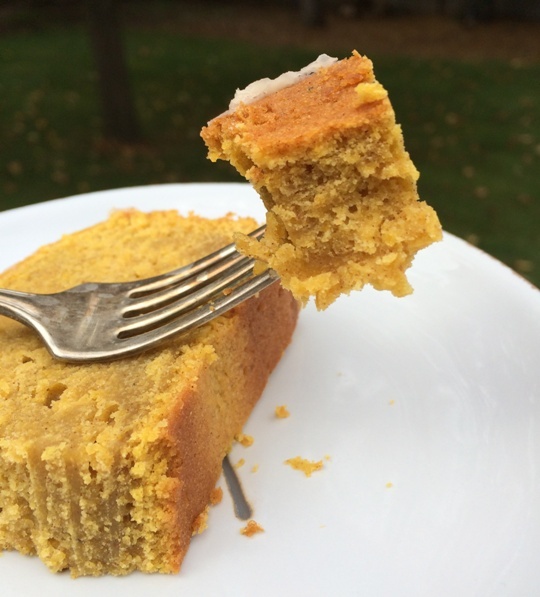 Or how about a squashy pound cake. Squish Squash as Tim calls it. Dense and moist and covered in glaze. It’s one of those cakes you can eat for breakfast or have as dessert. Versatile. Not to worry if you are a pumpkin spice lover. I’ve got a crazy good pumpkin spice recipe to share with you later this month. Thanksgiving dinner worthy. It’s not hard to make the squash puree. Here’s what I do: Cut the squash in half and scoop out the guts & seeds. Place the squash cut side down in a pan and bake at 350 degrees for 30-45 minutes or until a sharp paring knife skewers the skin easily. Take out of oven and allow to cool for a while until you can comfortably handle the squash. About 30 minutes. Scoop the flesh of the squash into a food processor or blender and process until it is silky and smooth. Measure out 1 1/2 cups for the pound cake recipe. This will make more than you need for the recipe but it freezes very well. I measured the rest of mine out a couple of cups at a time and sealed it into freezer ziploc bags. 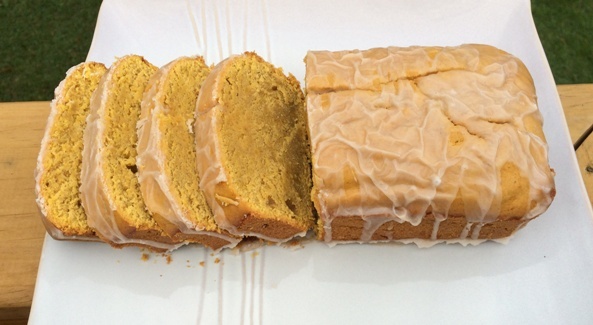 Now you can make butternut pound cake whenever the mood strikes you! Grease 2 loaf pans and set aside. Preheat oven to 350 degrees. In the bowl of a stand mixer cream together the butter and sugar. Add the eggs, squash, vanilla & milk. Mix to combine. Add the flour, baking powder, baking soda, salt, cinnamon, nutmeg. Mix until the batter comes together. Divide batter evenly into prepared loaf pans. Bake for 1 hour or until a toothpick inserted into the center comes out clean. Allow to cool for 30 minutes and then remove from pans and pour glaze over the cake. Mix all ingredients together and pour evenly over the 2 slightly cooled cakes. 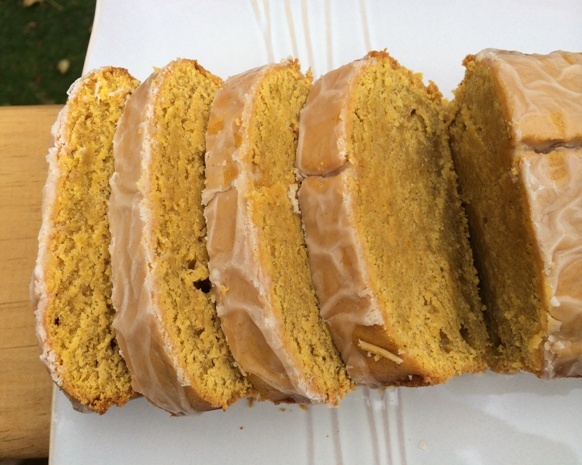 Posted in Fun Stuff, Sweet and tagged Buttercup Squash, cinnamon, fall baking, Pound cake. Bookmark the permalink.